Aspergers to me and AV is simply a different neurology, part of the autism spectrum. We see how this different mind offers so many strengths, sometimes with communication and cultural differences. So I am the President of Aspergers Victoria (AV). 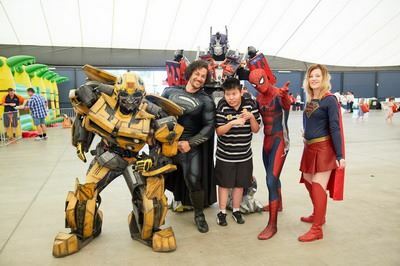 This is a small volunteer run not for profit of 18 years, run by passionate people with Aspergers lived experience to empower our Aspergers community. 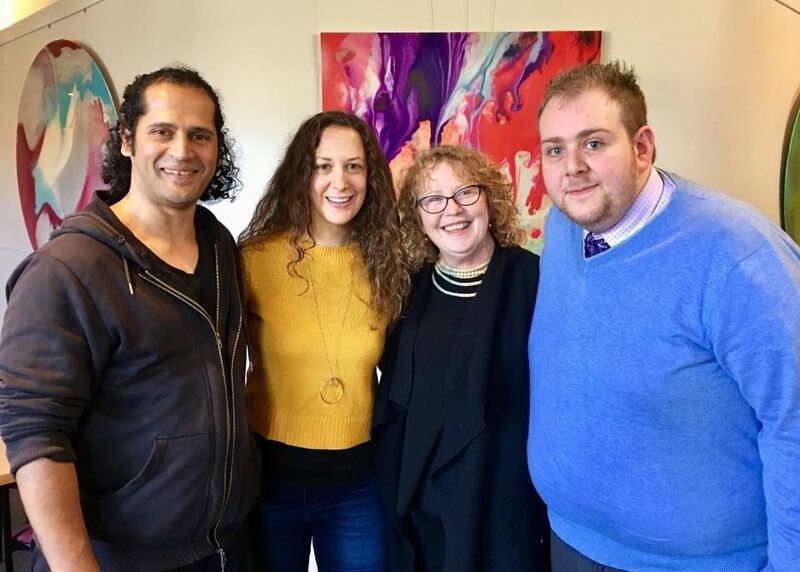 I believe I have grown up with Aspergers around me without realising I was within that interesting culture, so I continue to learn more as I try empower the membership community at Aspergers Victoria. AV’s key focus now is on the growing employment issue with the majority of our Aspergers facing unemployment when they are intelligent, creative and dedicated specialist expert staff – but have struggles with the social and communication aspects of life. It is a silent crisis that's looming. I have seen the amazing potential of Aspergers minds with many professionals such a surgeons, accountants, engineers, artists, CEOs and more having this high intellect neurology. To name a few that are mentioned online like few Bill Gates, Nicola Tesla, Jane Austen, Anthony Hopkins, Mozart, Abraham Lincoln, Marilyn Munroe, Einstein who all found their creative call and had differences accepted and celebrated – but not without their challenges. In the USA they have approximately 1 in 50 or so with autism they say and Australia where we have had few autism measures we’re saying 1 in 100 but we know it’s more with many undiagnosed or not disclosing. As Amaze research says over 80% know an autistic but only 20+% understand what that means. No serious discussion about the topic of business innovation, learning, and collaboration can afford to ignore neurodiversity. Neurodiversity is key to innovation. In particular people with Aspergers minds who think and work differently – who simply require some basic adjustments to flourish and contribute. Who after a short period can change and improve your systems, contribute ideas, and dedicate all hours to solving issues beyond others’ capacity. Each individual is different – and this concept that there is a “normal” is misleading and a myth. My father, a GP, always told me "there is no normal!". The concept of Neurodiversity recognises this – as the term’s creator Judy Singer says 'neurodiversity relates to all beings – all humans' and how neuro-difference is part of humanity. Its part of our culture mix. Aspergers is part of the basket of recognised neurological differences of neurodiversity which can include ADHD, dyslexia, dyspraxia, dyscalculia, dysgraphia and tics. These are NOT mental health conditions but simply brain differences. This involves a major shift away from the medical pathologising paradigm of Aspergers, autism and other neurodiverse minds as disabled with the value dismissed. 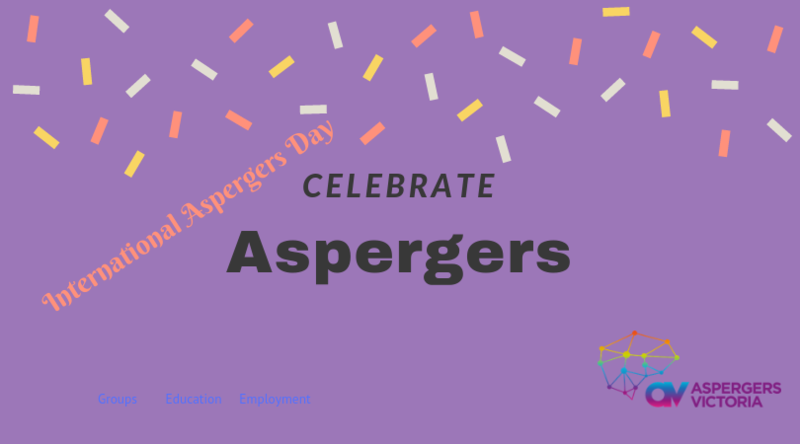 Instead of continuing to categorise our Aspergers specialists so difference is disability, Im talking about a shift in cultural values, in particular a proper appreciation of the value of human diversity in our social and employment norms. This means a shift in our approach to valuing Aspergers' specialties in knowledge, process and innovation – and a shift to inclusive work environments. To valuing their amazing productivity, loyalty and focus at work. Not dismissing autistics due to any social quirks or differences. This inclusive approach requires a cultural shift, moving from the unconscious bias in recruitment where you recruit “people like us” and from systems that encourage employees to be the same - to appreciating the business benefits of having different minds who can see your work, your approaches and your service in a new light. It also means changing your culture so Aspergers and other neurodiverse staff can work at their best. I am so pleased many Melbourne companies and departments are embarking on this important journey such as ANZ, NAB, PTV and DHHS. Jobs Victoria are also working hard at encouraging change. - how you recruit: interviews only test how good people are at interviews, not role suitability. Aspie strengths wont show here - maybe you can walk and talk instead of sitting face to face or do a trial week? 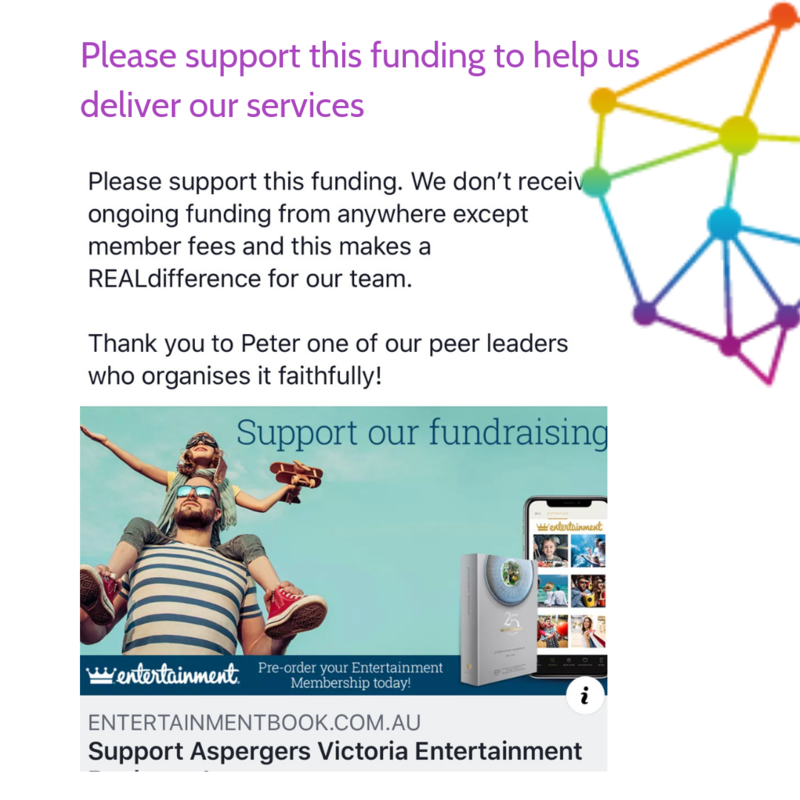 Aspergers Victoria now has work coaches who help companies adapt their systems, environments and manage cultural and communication adaptations that a neurodiverse individual requires so their potential is not limited by allistic systems of work. As many diversity and inclusion teams know, this needs to extends beyond recruitment to an inclusive culture that impacts how you design, deliver and manage your products and especially services for the end user. You will have neurodiverse customers as well you should consider. For transport, this means when an inspector checks a ticket , he knows not to make the wrong assumptions when the person can't look them in the eye. It means looking at train design for lightings, sound dampening and layouts so they can be more autistic friendly. Maybe offer one or two quiet train carriages per train with no mobile use. It means lots of warning about transport schedule changes which lead to anxiety for neurodiverse Aspies who can’t manage change. Have customer service trained to assist anxious Aspie commuters who can’t manage such change – or crowds. I love discovering more neurodiverse people every day in my life. I am so lucky to rub shoulders with such interesting thinkers and creators with wonderful strengths to offer, and who are here to help improve our world. We all just need to accept and understand them and welcome differences into our world. Members are invited to join us at the Aspergers Victoria AGM on the 21st November 7pm at the Nerve Centre Blackburn. Our AGM's short formal section will be followed by a celebration of our achievements over the year and a showcase of some of our member’s talents*, while Members share some food and drinks. This is a free event to celebrate and thank our members for their support this year, however we ask that you register for catering purposes. Donations to support our activities will also be welcome on the night. *We are looking for more volunteers who would be happy to do a short (2-3 minute) performance on the night. Examples could be singing a song, playing an instrument, performing a comedy/ magic/drama performance, or your own unique talent. If you have an idea, suggest it via email to events@aspergersvic.org.au or include it in your event registration form. We look forward to seeing you to catch up. 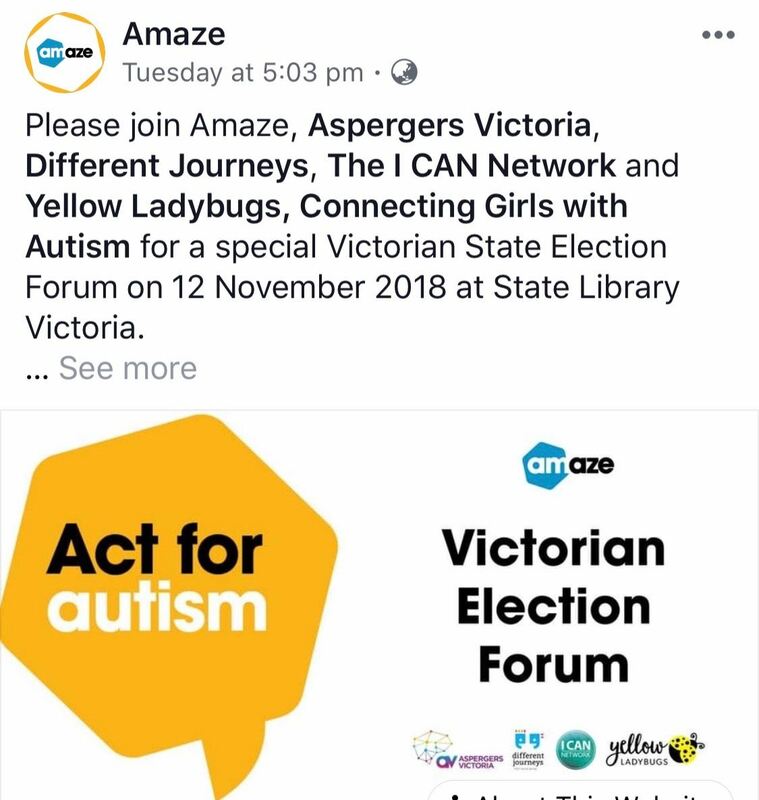 Please join Amaze, Aspergers Victoria, Different Journeys, I CAN Network and Yellow Ladybugs for a special Victorian State Election Forum on 12 November 2018 at the State Library Victoria. 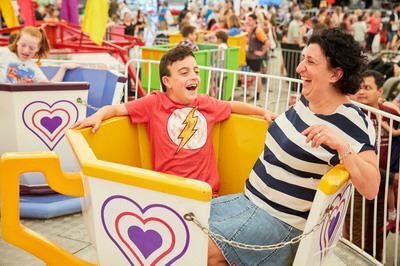 On 12 November, we are bringing together representatives from the Victorian Labor, Liberal, Greens and Reason parties to share with the autism community how their parties will act for autism. Book now at link below. Our confirmed moderator is ABC Investigative Journalist and 4 Corners Reporter Louise Milligan (Louise has an autistic son). Since 2015, lengthy inquiries and reviews into services for autistic people have resulted in hundreds of recommendations for improving supports, but not enough is being done. 55,000 autistic Victorians and their families are still waiting for change. It’s time to act for autism. The Senate has referred the inquiry into "the appropriateness and effectiveness of the objectives, design, implementation and evaluation of jobactive" to the Education and Employment References Committee. Aspergers Victoria is preparing a submission to go in this Friday highlighting our community's various Jobactive and employment issues. We need your help to advocate for change - by giving us your Jobactive feedback. Your specific Jobactive experiences can give our submission more impact. our brief Jobactive survey here by this Wednesday 26th September. The closing date for submissions is ​28 September 2018 and our volunteers need to finalise our final submission this Thursday so we are short on time but we can work fast - with your help. We appreciate this is a short time frame and don't expect everyone to be able to respond in time. We will use this information for our employment advocacy on other issues as well. Thank you to our volunteers Gayle, Mark and Patrick for preparing this submission! We recommend you watch this video about the benefits of neurodiversity. It is this approach that drives our empowerment model for our community.